At the start of this year I came across a new make up company called Model Co and I decided to try out one of their lipsticks. It is one of Model Co’s party proof lipsticks and I have it in the shade Smitten. Since receiving it has become my all time favourite red lipstick. I wore it on a night out last week and wow! Wow! WOWW! It was really easy to apply and it felt really creamy! I struggle so much with lipsticks because they usually feel really dry on my lips but this was the complete opposite! Another thing I noticed about the lipstick is that it did actually stay on my lips! I applied it at 7 pm and I didn’t have to reapply again till 12:30 am and when the party finished at 4am it was still on my lips if slightly faded! Also I found that it didn’t leave a red lip print on the glasses I was drinking from which was amazing bonus. 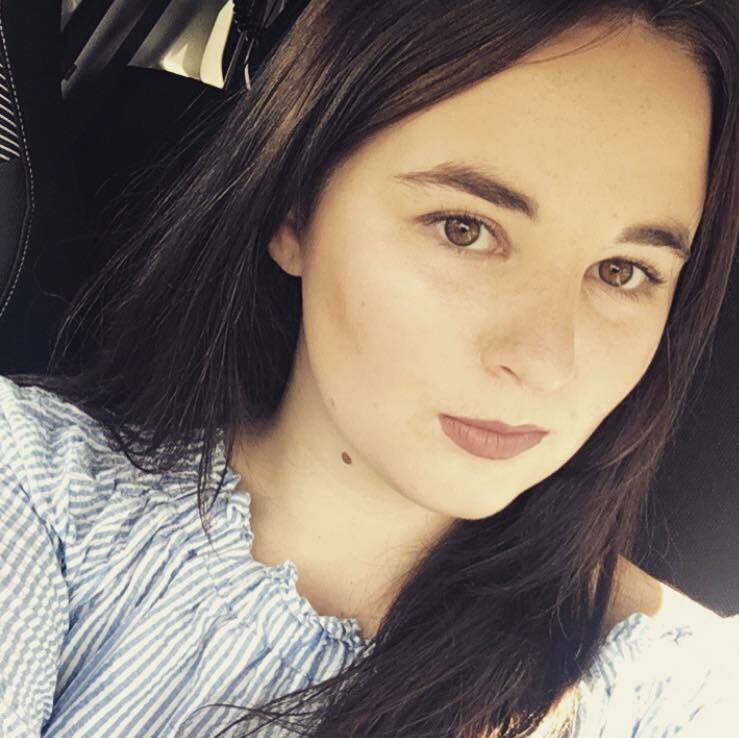 Overall I’ve completely fallen in love with this lipstick and I can’t wait to buy more of their lipsticks and to try some of their over products! Are there any other lipsticks you would recommend?? The end of the month is when I’m most likely to buy and try new products. I’ve been paid and the drug store is just calling my name. I go in to buy shampoo and I come out with two new eye shadow palettes, another foundation and nail varnish in colours I already own! 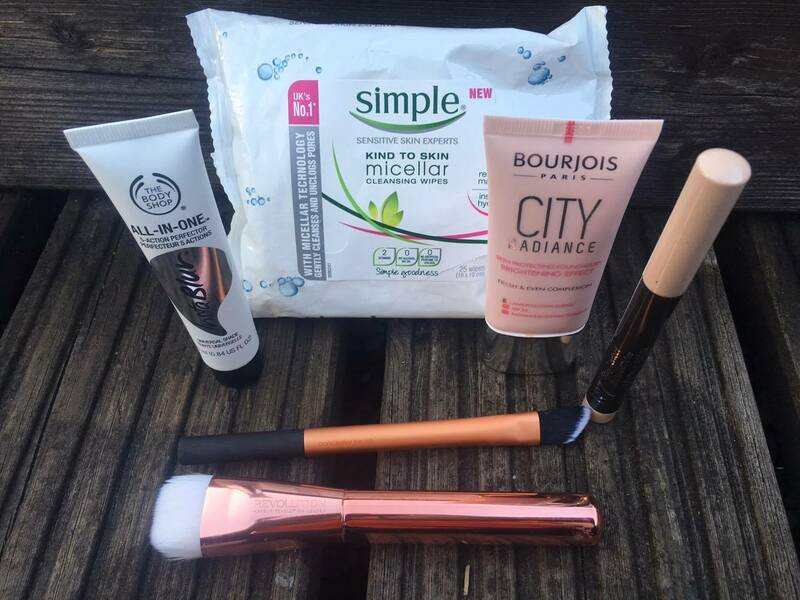 Of course this month is no different, but I now have you guys to share my beauty finds with. So welcome to my October vanity edit. I’m a big fan of micellar water and it plays a big part in my skincare regime. So when I saw these in Sainsburys I had to buy them. I have only used them for a couple of days so far and already I’m not even sure how I managed to go this long without them. My make up comes off so easily, I don’t have to scrub my face to get it all off. I’ve been wanting to try an eye shadow stick for a while now. 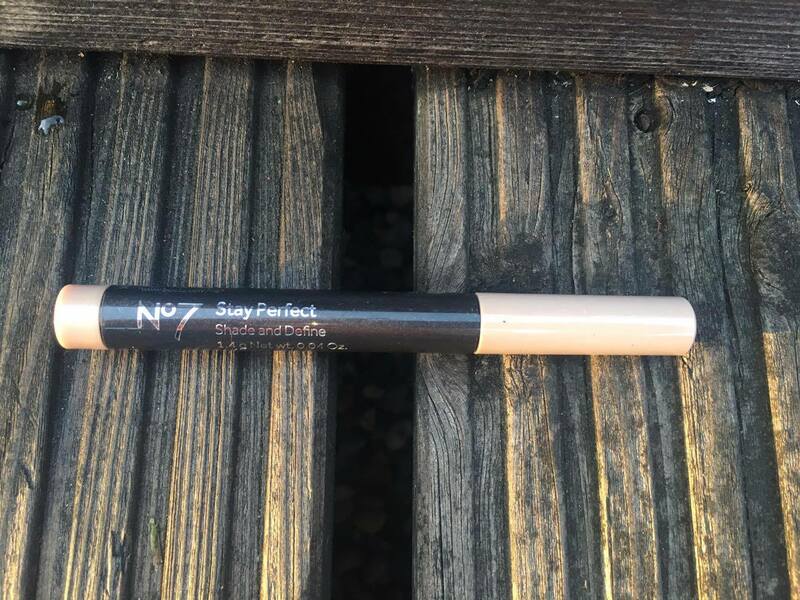 So I went around and swatched every brand had to offer.With the No7 I had to scrub my hand to get the eyeshadow off, so it is long lasting which makes me love it even more. I also tried using it with my mac corduroy powder eyeshadow in my crease. Which did look really nice but after a couple of hours it had moved and looked as if I had put it on in the dark. So this was very much an impulse buy. I don’t need it. I have six foundations already! Why did I need another one??? I did originally saw it advertised in a magazine and I am interested in seeing if it actually works. But definitely didn’t need it. A good concealer is definitely something I’ve been missing from my brush collection. Especially as I do have a lot of blemishes I like to cover. With my brushes I think its really important to pay a little more for the brushes and while real techniques won’t break the bank they are good quality. 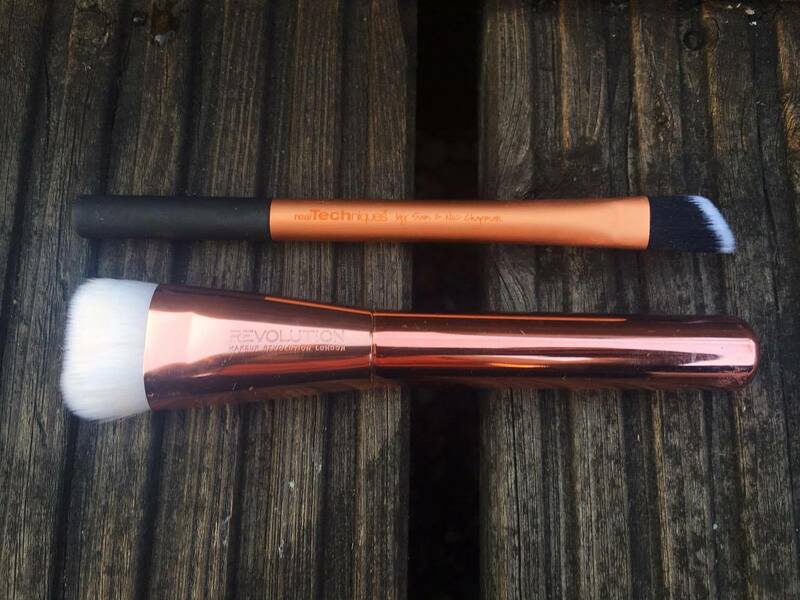 When it comes to contouring I love using the brush in Benefits Hoola, but I hate using the brush on other products. I saw this and it looks exactly the same to the Hoola brush. It also has metal effect like the Real Techniques bold metal brushes which I am obsessed with. The revolution collection is definitely more affordable, which helps. I’ve been on a hunt for a good primer for what feels like forever and I just can’t seem to find one that actually helps to keep my makeup. I’ve seen so many people talk on Youtube about how good this primer is and I really wanted to give it a try. 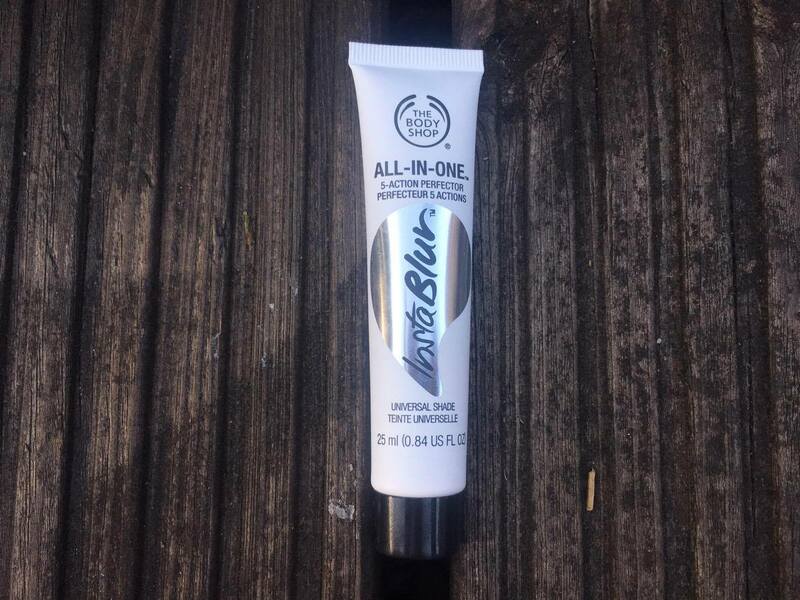 So far I love the consistency of the primer and I do believe it is actually keeping all my makeup in place. What have you been loving this month? and do you know of any good primers? 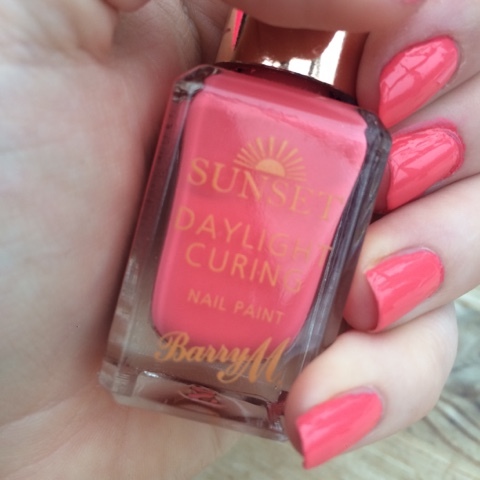 I want to talk today about the Barry M Sunset Nails. I saw this advertised in look magazine and I decided that I had to buy it. 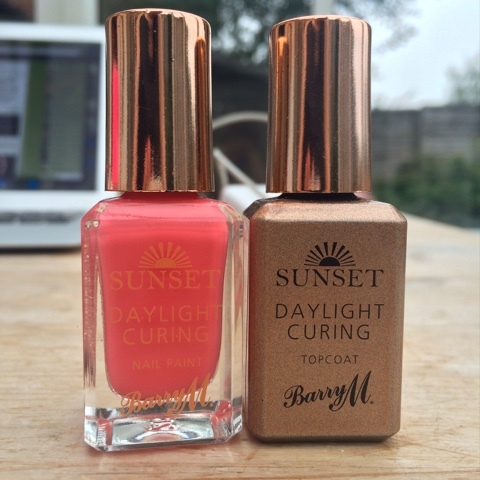 Sunset nails consist of 2 nail varnish (each bought separately for £4.99 each) one nail varnish is the colour and the second nail varnish is the top coat, which when dried is supposed to give off the same effect as gel nail varnish. The colour I picked was a very bright and summery colour. Which looked really nice on my toes and my hands. Perfect for my holiday in Spain. I bought shade 520 Peach for the stars and the top coat for my holiday. During application the colour coat dried very quickly so i didn’t have time to smudge (For Once!) Once i added the top coat it dried equally as quickly. When i went to touch part of my nail with a cocktail stick, after 10 minutes of applying the top coat, and the cocktail stick didn’t leave a dent in. Overall i would rate this nail varnish 7 out of 10. I did find that during the holiday my nails did chip and after a while the varnish could be pulled off. However i am putting this down to the amount of time i spent in the pool and in the sea (which was a lot). Nevertheless the colours in this collection are absolutely stunning and i will definitely be going out to buy some more. I would absolutely recommend it to my friends and my family as well as to you.